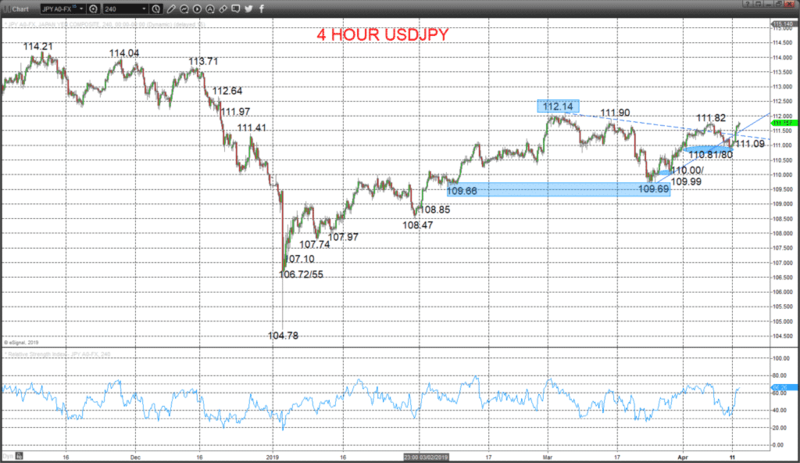 Last Friday (5th April) ahead of the US Employment report, we highlighted an upside risk for the USDJPY currency pair above a key level at 112.14 in our report. The subsequent setback avoided a more bullish shift, but recovery activity for the USDJPY Forex rate over the past 24 hours has highlighted this bull threat resuming. The USDJPY push higher has been driven by continuing positive US economic data, whilst US and global equity markets have remained resilient. This has left a “risk on” environment, in which the Japanese Yen is weakening, given its historic role as a safe haven currency. A Thursday bounce from just above our 110.80 support (from 110.81) to the push above 111.39 modest resistance, to ease negative pressures from the recent April setback and resume upside forces from the early April push higher, to flip the bias higher Friday. We see an upside bias for 111.82/90; break here aims for key 112.14. But below 111.09 opens risk down to 110.81/80.